Better bear market crash protection requires incorporating more information, not just tweaking the averaging algorithm or its time constant. All well-known market direction indicators use only a single source of data (usually the S&P 500) as the basis for determining market direction. Metaphorically, watching one knee of an elephant to know if it's going to take a step has definite value. But, watching three knees provides superior information, allowing earlier detection and eliminating false positives. Likewise, StormGuard-Armor achieves superior performance by incorporating three sources of data to provide three distinct views of the market. Tests demonstrate StormGuard-Armor is the industry's highest performance market direction indicator. Not only will it protect your assets during the next market crash, but when used in conjunction with a well-designed Bear Market Strategy, positive returns can be generated. 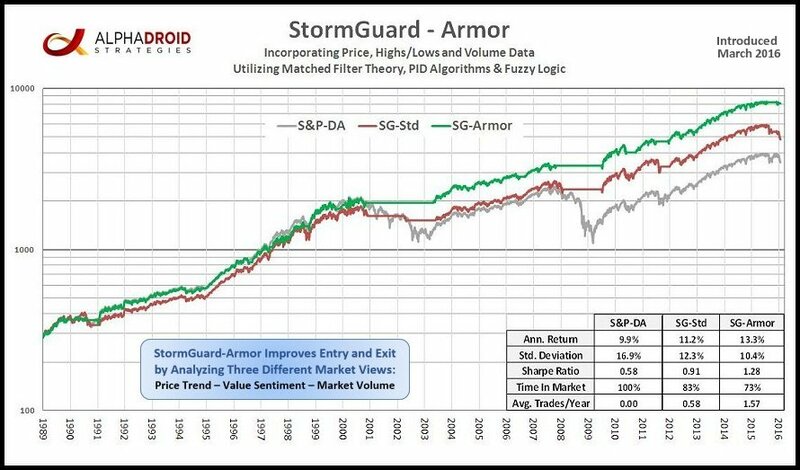 StormGuard-Armor is a composite of three measures we call Price Trend, Market Momentum, and Value Sentiment. Its improvements do not come from trying to improve predictive timing, but rather from actual event detection. These are "tells" indicating behavior changes of momentum and value investors. The Market Momentum and Value Sentiment signals are extracted from market volume and new highs/lows data sources. Twelve separate measures of the Price Trend, Market Momentum, and Value Sentiment signals are combined using the methods of "fuzzy logic" to produce the final StormGuard-Armor value. Even when applied to the S&P 500 (right), the improvement is clear. StormGuard-Armor Incorporates Event Detection, not Simply Timing Adjustments. Most market sentiment indicators incorporate only measures of price change using one or more moving averages. Although there are many kinds of moving averages and many time periods over which they can be calculated, it is often the case that adjusting them to improve performance over one period of time results in reduced performance in others. Reacting more quickly generally results in additional whipsaw losses, while reacting more slowly can result in going further over the cliff during a true market crash. The daily price record is limited in the amount of helpful information it can provide. In order to improve performance, additional information from other sources is required. Fortunately there are numerous measures of other market characteristics available, including daily volume, new highs and lows, advancers versus decliners, and volatility. The objective is to find additional predictive information that can be used like "poker tells" to improve investment decisions. StormGuard-Armor is the composite of three measures we call Price Trend, Market Momentum, and Value Sentiment. The Price Trend signal is essentially identical to the original StormGuard, which was derived from the application of Matched Filter Theory and performs measurably better than the classic 50/200 Death Cross. The Market Momentum signal further incorporates volume information, and may be thought of as a tell, indicating that momentum traders are changing their behavior. Note that a Wall Street "momentum trader" defines momentum as daily volume times the rate of price change in much the same way as a physicist defines momentum as mass times velocity. However, ordinary trend followers generally mix the terms trend and momentum together by inherently ignoring the consideration of volume. The Value Sentiment signal incorporates new highs and lows information, and may be thought of as a tell, indicating that value investors are changing their behavior. It is important to note that the new Market Momentum and Value Sentiment signals are not just timing adjustments made in hindsight, but actually provide signals prior to serious price movements. The first chart illustrates that during the market's rough patch in 2010, it was only the momentum signal that indicated trouble in the market. In 2011, during the run up to the August 1 selloff triggered by the S&P downgrade of U.S. debt, the Market Momentum signal again indicated trouble ahead of the event. However, in the second chart it is the Value Sentiment indicator that indicated trouble long before the August 2015 market drop triggered by trouble in the Chinese markets. The improvements provided by StormGuard-Armor do not come about from trying to improve predictive timing, but rather from actual event detection. These are tells indicating behavior changes of momentum and value investors. The Market Momentum and Value Sentiment signals are extracted from the additional data sources using PID (proportional, integral, and differential) control algorithms to condition them appropriately. The Price Trend, Market Momentum, and Value Sentiment signals are then combined together using the principles of "fuzzy logic" to produce the final StormGuard-Armor result. Whipsaw Loss arises when a precipitous drop occurs before StormGuard generates a sell signal and then subsequently returns to higher levels before a new buy signal is generated. There have been six prior instances of whipsaw losses during market corrections over our 30-year database. All six instances are now properly detected. Whipsaw loss has been either significantly reduced or eliminated for all six instances without any collateral damage. Although StormGuard-Armor is currently at risk of another such whipsaw event, SG-Armor+ is now in place to deal with it effectively. Drop-N-Pop False Triggers occur when a fearful news event causes a precipitous, but quickly reversed, market drop that is sufficient to trigger StormGuard-Armor even though the event has already reversed itself. When triggering after the short event has come and gone, the strategy is forced to sit on the sidelines for a month while a bull market goes on without it. There have been 3 prior instances of Pop-N-Drop False Trigger losses over our 30-year database. The Animated Chart (above right - hover over to enlarge) examines the most recent five years to illustrate exactly when and how improvements were made in this interval by detecting and acting on these short-term market patterns. 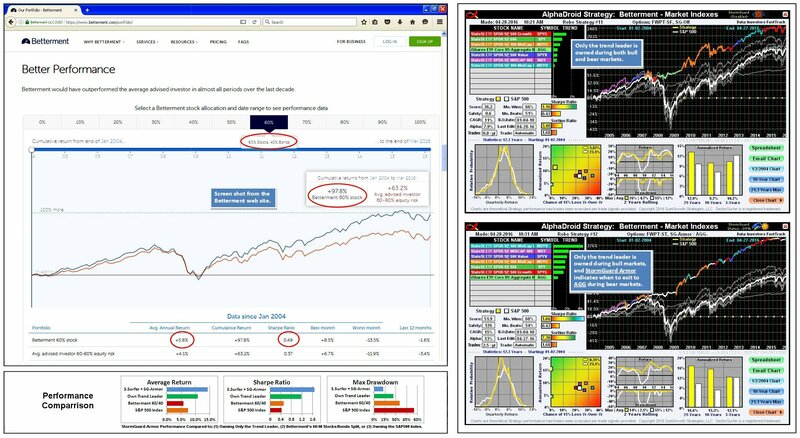 The animated chart cycles through four slides: (1) Using the well-known Death Cross indicator (50-day average crossing the 200-day average) to exit the market to a money market fund ($CASH); (2) Using StormGuard-Armor to exit the market to $CASH; (3) Using StormGuard-Armor+ to exit the market to $CASH; and (4) Using StormGuard-Armor+ to exit the market to the integrated Bear Market Strategy BMS-A. Correction of the Nov. 2014 and June 2016 Drop-N-Pop false trigger events by StormGuard Armor+ is easily noted, as is the whipsaw reduction provided in March of 2016 and January of 2019. Other similar events in our 30-year database are likewise improved. That devil in the details really matters. How They Work: Both upgrades utilize short-term pattern recognition algorithms that were able to handle all identifiable events in the 30-year database without generating false triggers or creating other collateral damage. There are no special rules involving specific events. The Drop-N-Pop algorithm disables StormGuard-Armor from triggering at month-end if in the past 6 weeks there has been a 5% or more drop followed by at least a 90% recovery by month-end during a bull market. Whipsaw loss reduction is provided by promptly detecting a satisfactory market correction rebound during a bull market that reliably indicates the market will continue heading higher. A rebound of at least 5% with no prior higher-high in 7 weeks (or slightly shorter periods for stronger rebounds) is the test. 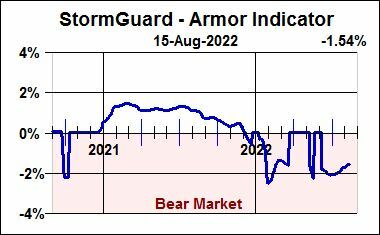 When this condition is met, StormGuard-Armor will indicate a fixed value of 0.02% until (1) StormGuard-Armor otherwise turns positive, (2) the market drops below its recent bottom, or (3) at least 6 weeks have passed, any of which resume normal StormGuard-Armor operation. Enabling StormGuard-Armor+: SG-Armor+ will automatically be applied to all Strategies employing StormGuard-Armor from 12/25/2018 forward without the need to do anything. Any Strategy that is substantially edited (more than its name or display options) and posts a Last Edit Date of 12/25/2018 or thereafter will additionally apply the SG-Armor+ model across the entire data set and will indicate its use of SG-Armor+ in the chart's subtitle. You may experimentally disable SG-Armor+ by adding the character ''-'' to the end of your Strategy name. You must also further substantially edit the Strategy to cause it to recalculate the entire trading history from scratch. Similarly, if you remove the ''-'' you must also substantially edit the Strategy for the change to take effect across the entire trading history. You must also further substantially edit the Strategy to cause it to recalculate the entire trading history from scratch. Similarly, if you remove the ''-'' you must also substantially edit the Strategy for the change to take effect across the entire trading history. 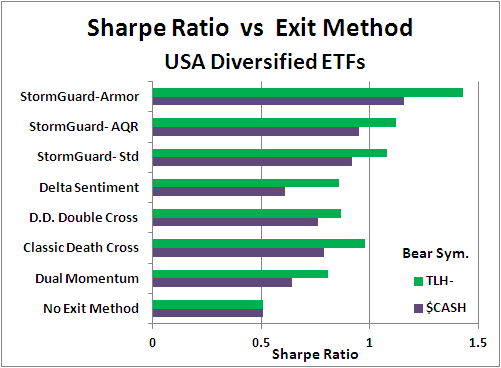 Application Notes: When you apply SG-Armor+ there are some odd things that can happen, including (1) If you use a Bear Market Strategy that performs well during one of the improvement periods, then SG-Armor+ may provide little improvement for that period. 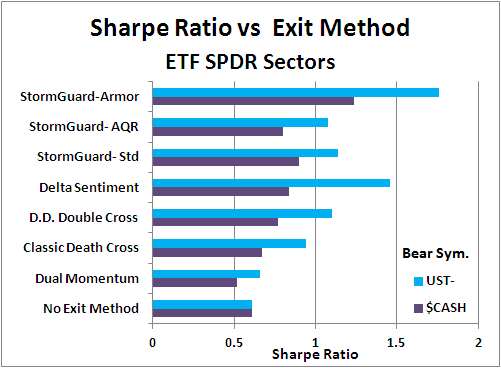 (2) Similarly, if the trend leader picked by your Strategy performs poorly (relative to the Bear Market Strategy) during one of the "improved periods", then implementing SG-Armor+ may slightly reduce the Strategy's performance. A high-performance Bear Market Strategy that rivals your Strategy's bull market performance during this transitional period is not necessarily a bad thing, and may simply indicate that the responsible fund is a bit on the volatile side. 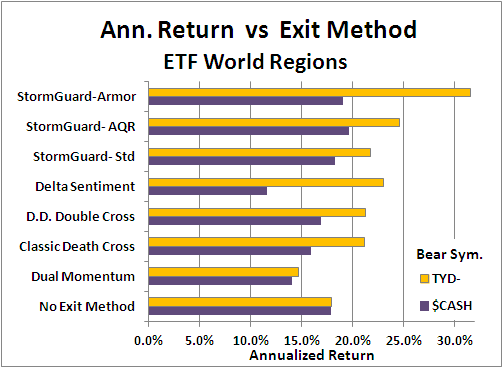 The charts below illustrate the improvement provided by StormGuard-Armor over (1) owning only the trend leader, (2) Betterment's 60/40 stocks/bonds portfolio, or (3) simply owning the S&P 500 index. Click the charts for details. 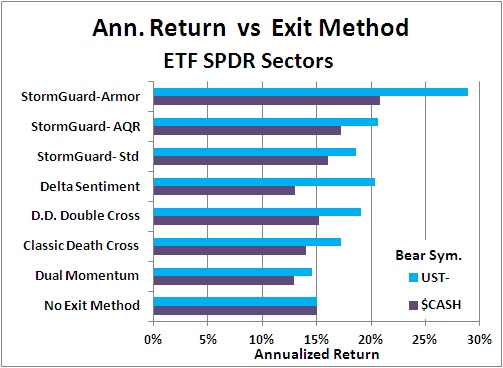 To reasonably compare AlphaDroid's performance to Betterment and the S&P 500, a Strategy was constructed holding only six ordinary largecap and midcap ETFs (SPY, SPYV, SPYG, MDY, MDYV, MDYG) along with the aggregate bond ETF AGG. The Strategy for owning only the trend leader has StormGuard disabled and the algorithm simply selects the best trending of the seven ETFs at the start of each month. 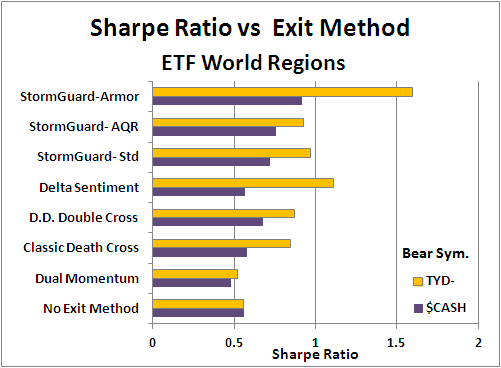 When StormGuard-Armor is enabled, the Strategy is restricted to owning AGG during bear markets. While the 60/40 stocks/bonds split helps reduce Betterment's Max Drawdown and marginally improves its Sharpe Ratio (a measure of average return/volatility), it does so at the cost of lower returns. In the table and charts below, the performance of seven market direction indicators is evaluated for each of three major classifications of ETFs (broadly diversified, U.S. sectors, and world regions). The market direction indicator determines whether it is a bull market (risk-on) or a bear market (risk-off). During a bull market the Strategy selects the trend leader to own at the end of each month from among the Strategy's candidate ETFs. 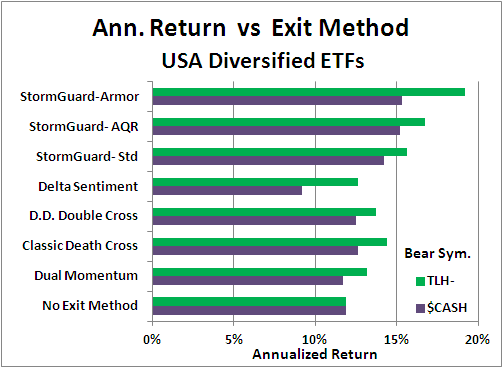 During a bear market, the Strategy will either move to the safety of CASH or alternatively own a long-term treasury ETF, depending on its configuration. Performance for both of these Bear Market Strategy configurations is detailed below. Please review the Bear Market Strategies page for a discussion on how hindsight selection bias can be avoided during bear markets using a well-designed Strategy that selects from a diverse set of asset classes that often (but not always) do well during a market crash. Protect your assets in the next market crash with StormGuard-Armor — it sets the standard for market crash protection!